TheTravelScoot is the world’s lightest and most compact electric mobility scooter with a quality you will appreciate. It’s the ideal scooter for everyone who’s feet are not playing along but who are otherwise still in a fairly good shape. The innovative folding mechanism allows, for the first time, a 3-wheeled scooter to fold down to the dimensions of a 2-wheeler. Set-up and break-down takes less than a minute. It fits where no mobility scooter has ever fit before! Seat and battery removal takes just a few seconds. A few more, and the frame is done, too. The TravelScoot weighs 30 lbs without battery. Remove the seat and seat back, and it weighs less than 24 lbs. - The TravelScoot Deluxe (model with lithiumbattery) or TravelScoot Standard (same model with lead acid or lead crystal batteries). Both are work for bulky ways and tough inclines. 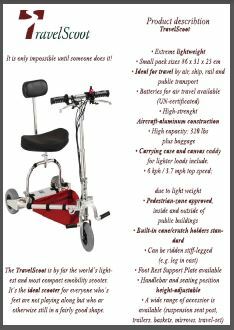 - The ultralightweight TravelScoot Shopper (even 4 kg less weight) but made just for good surfaces and no hard inclines due to a smaller motor and smaller tires. 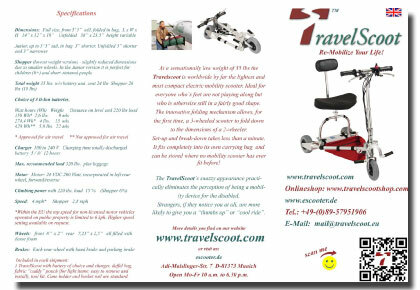 All TravelScoot are in 2 different sizes (full sized model for > 1,6 meter bodysize or junior sized for < 1,6 m bodysiz) available. 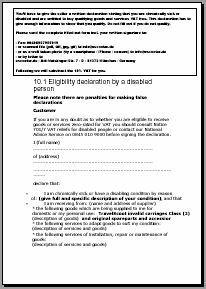 Youll have to give escooter.de TravelScoot sales a written declaration stating that you are chronically sick or disabled and are entitled to buy qualifying goods and services VAT free. This declaration has to give enough information to show that you qualify. Faxed declarations and declarations made via the internet are also acceptable. AND YOU WILL FIND THE NET PRICES IN THE CART FROM THAT MOMENT ON. Spacer for a higher seat position (not recommended for suspension seat posts!) Distanzhülsen zur höheren Sitzpositionierung - nicht für die gefederten Sattelstützen empfohlen!